To kick of Red October, my month long feature on all things periods I had hoped to write something truly amazing and insightful about why the subject is still so taboo. Life however decided to intervene and leave me with no time what so ever to write such a post, so I’m going to kick things of with a fun and informative infographic about the menstrual cycle courtesy of iheartguts.com. After all it is this cycle that controls periods so maybe it can be viewed as me starting this at the source! I’ve got my fingers crossed that life will get the hell out of my way and give me some time to blog tomorrow. If you want to join in on the period discussion I’d love for you to check out and participate in my Red October mini blog carnival where I’ll be giving away lots of cool products and blogging about all things pink & red all month long. Omg. Love this. 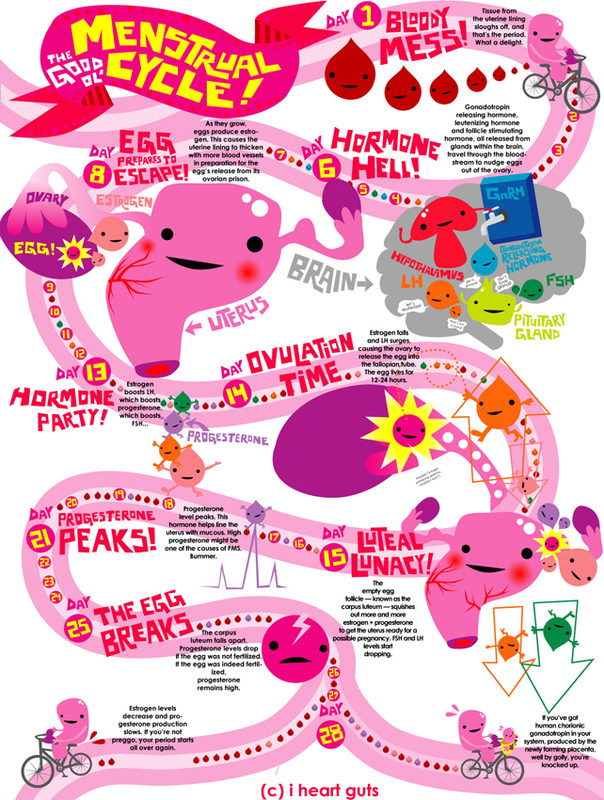 I didn’t even know that such awesome infographics existed, let alone one detailing the menstrual cycle to this level. Hope that things calm down in life… can’t wait to read the rest of your Red October features! So cute! I love this infographic.